Power Post Hole Auger Details - Quasius Equipment, Inc. 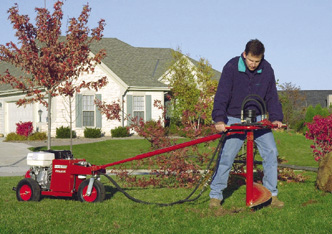 The Little Beaver Hydraulic post hole auger is the best choice for drilling post holes. Rather than the conventional high-rpm low-torque ice drill the Little Beaver auger uses a high torque hydraulic motor power head. This power head is connected to a power supply unit powered by an 11 HP engine through two hoses with quick connect couplers. A steel sliding torque tube snaps onto the power unit and the drilling head to absorb any kick back by utilizing the power unit as an anchor. This makes for effortless drilling by the operator. Because it is a hydraulic auger, the control valve features a reverse as well as forward direction. That way if you get hung up on a rock or tree root you can simply reverse the auger to get it out of the hole and clear the obstruction. The tool is a simple one man operation to use. The power unit is on wheels and will follow you around as you walk from hole to hole. Because of the low speed and high torque this is one tool that you will not want to push on to get the job done. If you push on it you'll thread the auger right into the ground. If that happens simply reverse the auger and it unscrews itself right out of the ground. Best drilling operation is to hold back slightly and let the auger feed itself in slowly. Click here to view a copy of the operating instructions. Augers come in 4", 6", or 8" diameters. Each auger is capable of drilling up to 3-1/2' in depth but snap-on auger extensions extend that by another 3' to give you a 6-1/2' maximum drilling depth. Each piece snaps together for operation and easily disassembles for transport. The 5 pieces do take up some room so they do not fit into car trunks but go just fine into pickups, vans, SUVs, or small trailers. It only takes one man to operate this unit but it will take 2 persons to unload the power unit when you get home unless you have a ramp of some sort. These units are very popular on summer weekends so we urge that you call ahead to reserve one if that is when you want to do your job. If you need larger diameter augers please feel free to look at our 2 man version of this unit or click here to access a shortcut. 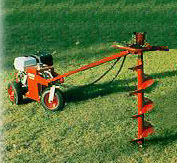 Auger Diameters - 4", 6", or 8"
Auger Drilling Depth - 42"
Auger Extensions Length - 36"
Power Source Weight 171 lbs.